A Public Service Announcement (and opinionated article) with GUITARS. Recently, much of the music world celebrated a crucial holiday and anniversary that is a reminder to the beauty of the very art form itself. 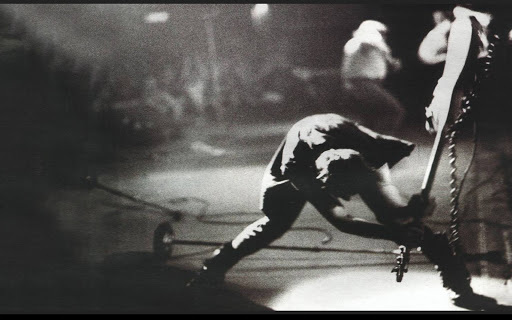 International Clash Day, a yearly campaign started by Seattle’s KEXP public radio station, celebrates the music of the legendary 70s/80s English punk band The Clash on every February 7th. The band has claimed a legacy in their vast musical influence in the fusing of punk, rock, and reggae. They have also more recently gained fame in current pop-culture for the use of their hit “Should I Stay Or Should I Go” in the Netflix series Stranger Things. However, the main aspect of their legacy that the day celebrates is their revolutionary activism that gave them the nickname “The Only Band That Matters”. On Thursday’s celebration, hundreds of radio stations, record stores, and city events around the world (more than ever before) carried on the legacy of keeping music alive as an active art form for artists to stand up for any cause they care about. Not only was Thursday a timely celebration of International Clash Day due to its falling on the 40th anniversary of The Clash’s undying masterpiece in 1979’s London Calling, but it comes around the time in which there has been a large surge in musical activism. Despite continuous complaints of the out-of-touch nature of music award shows, especially with the GRAMMYs, this year the celebrated songs were laced with “woke” and deeper political messages. Childish Gambino’s This Is America (race relations and gun violence, among many other issues in American culture), Brandi Carlile’s The Joke (gender relations and the sociopolitical climate), and Drake’s God’s Plan (charitability and giving back to community), are among many GRAMMY award nominations from Sunday that carry on The Clash’s craft on the main stage of music. These artists (among so many others) speaking meaningful socio political messages through their music has provoked very divisive responses not only toward the specific activism itself, but very scarily toward the overall concept of activism in music. The phrase “shut up and sing” has gathered popularity among listeners who prefer to forgo listening to artists due to differing political viewpoints, preferring to remain in their safe spaces of light mainstream pop music and artists who agree politically with them. This trend is especially concerning as it messes with the true identity of music. Music should be seen as an artform, not a service or as entertainment, and art requires human expression. Arguments toward restricting this type of expression from artists restricts the artfrom away from it’s essential identity. Personally, though I am a fan of many bands who I share many beliefs with, I can practically balance out those bands with bands I love that I do not politically identify with at all. Even despite my reservations against their beliefs that fall significantly farther left on the spectrum than I do, The Clash receives and deserves endless praise and lyrical references in this article. On the other political hand, my Trump-hating self has enjoyed the music of pro-Trump artists. The beauty of music is in the unique positive takeaways about every artist, embracing and appreciating all of the different forms of positivity they contribute to the community of music. Sometimes in your own mind these can be more political, musical, lyrical, visual, or social, it really depends on you and the artist and it never is required to be all these aspects at once. For that reason, it would be irresponsible to dismiss an artist for just one of them. The point is, although artists may not agree with everyone, they certainly speak loudly to everyone they can, and listening and just thinking is a beneficial exercise in gaining full, accurate, and more beneficial perspective on the world around us, regardless of the end result (agreement or disagreement). It’s a valued American reality we have encased in the first amendment, and a strong place of expression like music deserves to maintain those values. Although it is recognizably unrealistic to say that public figures like artists can change a political mind, it is far more realistic to say that public figures like artists can provoke the beginning of more important conversations that would in turn make these large developments happen. So the next time you listen to your favorite artist or any artist, remember that you aren’t doing the favor to them by enjoying and paying for their music, but rather they are doing the bigger favor to you by having the courage to be vulnerable in their expression, provoking their talent and playing the music that they truly care about.